Doug's Cousin, Madison, (Our sweet Flower girl) is going on the registry for her second double lung transplant at the age of 18. Madison was diagnosed with Cystic Fibrosis and has been fighting all of her life. Please help us take some of the financial burden off this family. Madison you are so very loved!!! Madison Taliaferro was born with a terminal genetic illness, Cystic Fibrosis. In 2012, she was placed on the UNOS list for a double lung transplant. On November 5, 2012, he second chance at life became a reality and she underwent a double lung transplant surgery. Her donor, Alex Lott, was able to give Madison six more years of a great quality of life. She has made so many wonderful memories and has been able to experience all of the firsts that we sometimes take for granted. She still has so many firsts she would like to make, but her time is running short. 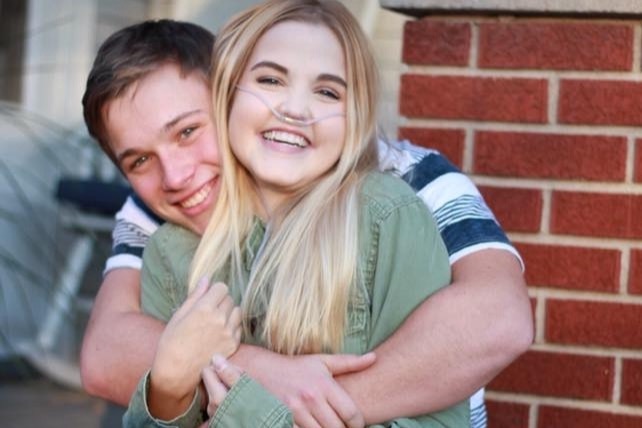 The doctors aren't sure what caused the chronic rejection to occur, but one minute she was enjoying her homecoming dance and the next week she was fighting for her life. Her lung function declined from 48% to 22.5%. Her quality of life quickly dwindled from her being actively involved in school, football, church, and clubs to being home bound/hospital bound. The rapid decline has not only been overwhelming for her, but for the family and her community. She has been given two options, both of which are fairly scary. The first was to try and make her as comfortable as possible at home for as long as she has left and the second was for her to be listed for a second double lung transplant knowing the risks for a second transplant are so much higher than the first time around. Madison has decided she isn't done fighting and isn't done making memories. She wants to go to her senior prom and graduate with her classmates. She wants to get her first job and hate working it. She would love to be able to go to college and learn phlebotomy. Madison has been actively involved in her school. She was the football manager for the Holton Wildcats, the VP of her Senior class, a member of SADD, SAFE, JCYC, Resits, Unity Task Force and is in the Notables choir. To be placed on the transplant list, Madison and her mom will need to relocate to St. Louis at the end of this year, if not sooner. The family will soon go from two incomes to one and the financial difficulties already existed from recent hospital stays and added medications and equipment. Anything you can contribute is appreciated, if you are unable to help financially at this time, please pray or think good thoughts for this family. Beneficiary- Mike Taliaferro (Madison’s Father). All donations will be used for Madison’s medical bills.